Since the book’s publication, Meredith has been invited to be on a panel at the American Nuclear Society annual meeting. “That kind of invitation did not happen before the book,” Meredith notes. Another honor happened at a recent convention. The North American Young Generation in Nuclear (NAYGN) meeting is part of the annual Nuclear Energy Assembly, which was held in May 2017 in Scottsdale, AZ. The convention organizers contacted Meredith and arranged for a bulk order of her book. At the convention, every NAYGN participant received a copy of Campaigning for Clean Air in their welcome packet. “My book was only one part of the advocacy events at the meeting. But still, my book was there!” says Meredith with obvious pride. Meredith’s nuclear advocacy work includes writing, speaking at hearings, and organizing rallies. Meredith was a relentless and formidable campaigner for keeping Vermont’s only nuclear reactor running (Vermont Yankee closed in 2014). She received a President’s Citation award from the American Nuclear Society for her work. However, she wasn’t always an advocate. Her background is energy research: among her many accomplishments, Meredith was inventor on several patents in pollution control for fossil fuels and did extensive work in corrosion control for nuclear plants. In her retirement, she developed a skill set in advocacy. “Many of the people who led the opposition to Vermont Yankee had activism training or even graduate degrees in advocacy,” reflects Meredith. “I knew the technology of nuclear energy very well, but I knew little about how to persuade people to support it.” As a result, Meredith learned how to write a good letter to the editor, how to handle herself in a debate, and much more. Other nuclear supporters started asking her for advice. 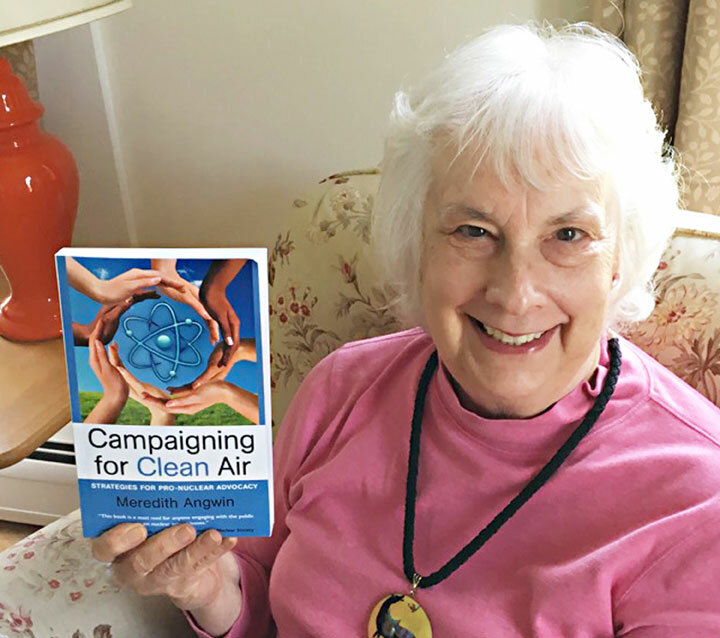 After a number of people asked her the same questions, Meredith felt it was time to write a book containing strategies and advice for pro-nuclear advocacy. Meredith wrote a solid book and obtained great endorsements. Still, she knew her book would be compared with anti-nuclear books that are published by big publishing houses. As such, her book could not look self-published; it had to look mainstream or better. That’s where 1106 Design came in with editing, proofreading, indexing, cover and interior design, a new logo, a website, and postcards. “Many self-published books look amateurish. Due to 1106 Design, my book looks professional. It can stand next to any big-publisher book and hold its own. That matters to me and to my readers. In the energy field, an amateurish-looking book lacks credibility,” says Meredith. We wish Meredith continued success with Campaigning for Clean Air: Strategies for Pro-Nuclear Advocacy and can’t wait to hear what the future has in store for her!